1 Peel the ginger and finely chop. Add ginger and sugar to a pot with 250 ml (approximately 1 cup) water and bring to a boil. Reduce heat to low and simmer for 10 minutes. Pour through a fine-mesh sieve into a second pot. 2 Rinse lemon and lime, wipe dry and grate the peel. Squeeze fruits separately. Add the lime and lemon peel to the ginger-water mixture, boil for 1 minute and remove from heat. 3 Add 2 tablespoons of lime juice and 1 tablespoon of lemon juice to the mixture. 4 Allow sauce to cool completely, then pour into a baking dish or a shallow dish and freeze until hard for 3-5 hours (preferably overnight). 5 Peel, halve and core the papaya. 6 Remove the flesh and cut into small cubes. Bring the papaya to a boil with honey and white wine. Remove from heat and let cool. 7 Purée the ice cream briefly with an immersion blender and put back in the freezer for about 1 hour. 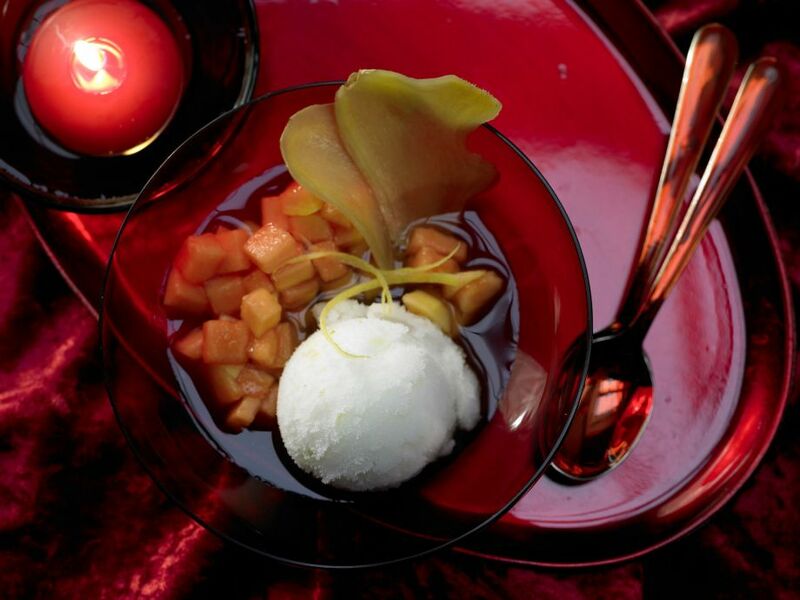 Serve the sorbet with the papaya compote.